Okay, I'll admit it....I'm decorating for the 4th of July even though it's only the middle of June. I found two bins of American Flags and Buntings in the attic and I'm screwing cup hooks into the siding! I'm in full-on, "I LOVE AMERICA and I'm proud to show it!" mode. What can I say? 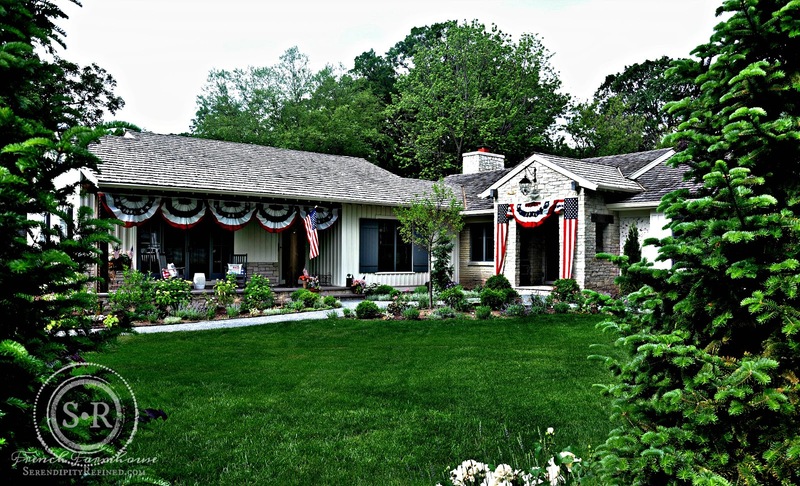 It has been two years since I've had a home to decorate for the 4th and I've missed it more than I realized. 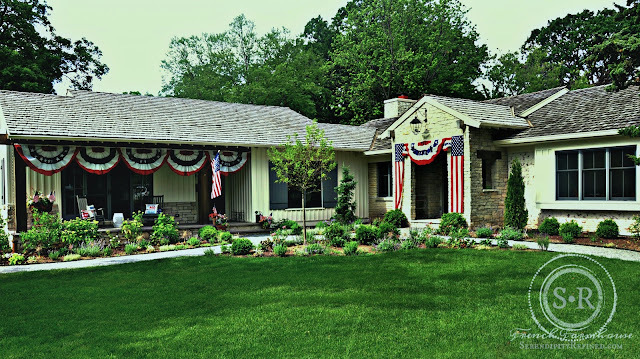 Over the last 30 years, we've had 4th of July celebrations ranging from a simple "red, white and blue breakfast" to back yard cookouts, to entire days spent entertaining family and friends on the 4th of July. 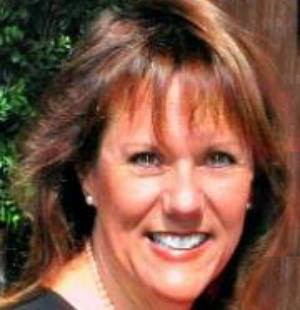 *With the exception of one 4th of July when we mixed and poured several thousand pounds of concrete (of which I am STILL being reminded by my sons). It has been one of my favorite holidays for as long as I can remember. There was something magical about celebrating the 4th of July.... almost like the magic of Christmas.... but without the boots.....or mittens.... or scarves. It was that simple kind of magic that you find on hot summer days filled with the sound of marching bands and nights when fireworks outshine fireflies. Days spent running through the sprinkler, eating burgers and corn on the cob, homemade icecream...and apple pie. I have such wonderful memories of celebrating the 4th of July that I knew when I had my own children, I wanted them to have the same kind of memories of this special holiday (except for the aforementioned "concrete pouring 4th"). 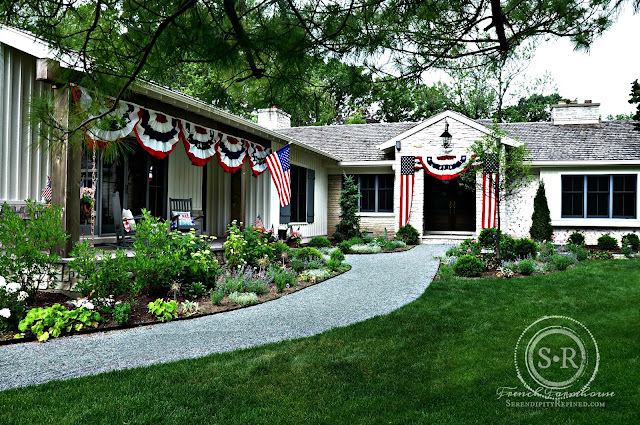 Beginning in the 1980's with our first home, I've steadily collected flags and buntings, adding a couple each year. 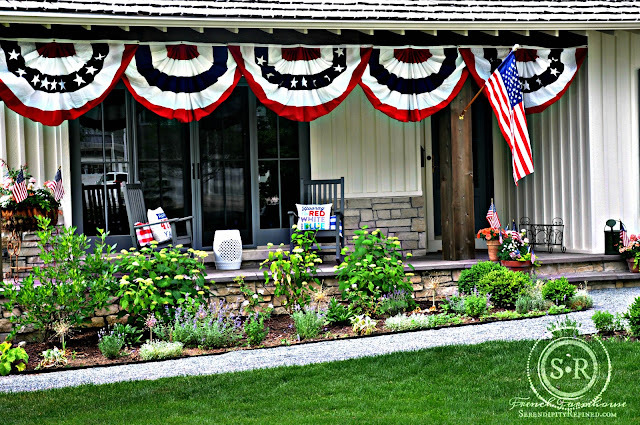 As homes (and my children) grew and changed, the collection of 4th of July decorations grew as well. Now that we live in the farmhouse, I've found that for the first time in many years, there is plenty of patriotic decor for every patio and porch (with some to spare). 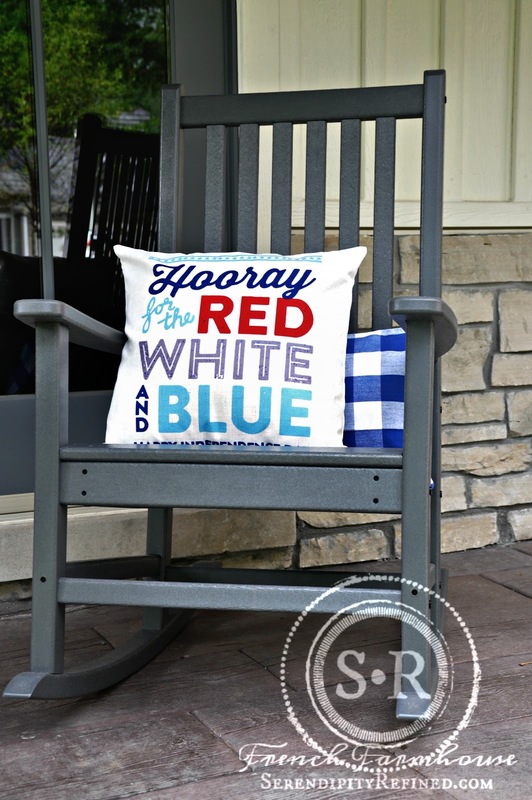 My rocking chairs got a quick patriotic update. I used tea towels to cover the lumbar pillows and added a couple of other pillow covers that I found on Etsy. 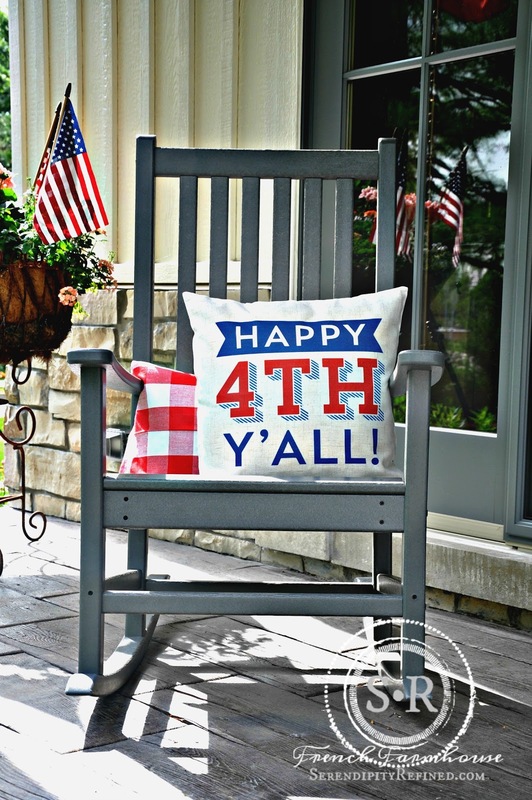 I fell in love with that little pillow that says "Happy 4th, Y'all!" Isn't it perfect!? I'm slowly making my way around the house, hanging buntings and putting flags in my potted plants. I'm not finished yet, but I could be. 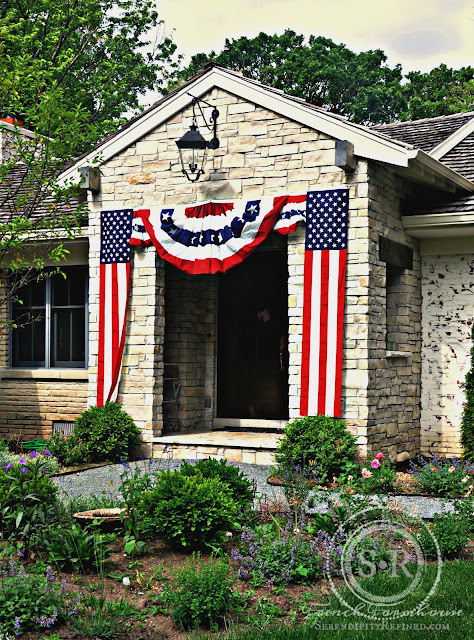 There's really no right or wrong way to decorate for Independence day. 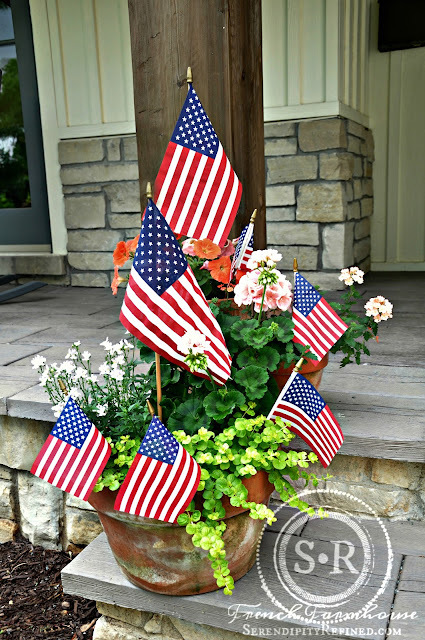 It can be as simple as hanging out Old Glory or purchasing a few small flags from the market or hardware store to line the sidewalk or place in a flower pot. What about you? Do you celebrate the 4th of July? Do you have any Independence Day traditions? 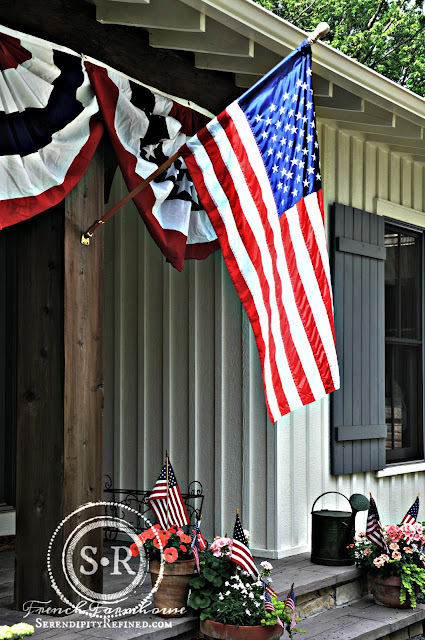 As you have probably guessed by now, my 4th of July traditions involve lots of red, white and blue, family, friends, food, fireworks....and above all, FUN! Now that the outside of the farmhouse is suitably draped in American flags and enough patriotic red white and blue bunting that the neighbors are probably wondering what in the world is going on at our house (not the first time in the last 3 years, I'm sure), I'll probably do a little decorating inside. Who knows, it could happen!